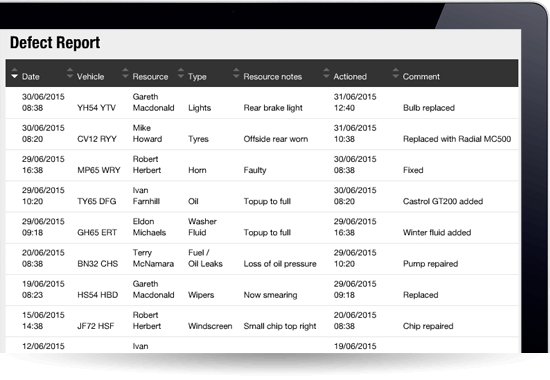 Manage all your fleet data for vehicles, trailers, assets & equipment. Proactive alerts draw attention to the expiry of MOT, road-tax, insurance and service intervals and the document upload facility lets you access records and certificates on-demand. Odometer readings are automatically updated. Uploaded fuel transactions are linked to actual mileage so you have a true view of vehicle MPG. Driver behaviour snapshots ensure you can deliver targeted training and de- briefs as part of your fleet and risk strategy. Defects are captured on the mobile app as part of mobile workers’ daily vehicle and equipment checks. This information is instantly logged in the Fleet Management tab of JourneyWatch and is reported in the defect report as well as through a proactive alert. This ensures that defects can be managed through to resolution and also ensures job scheduling takes into account vehicles, assets and equipment that are out of action. Let JourneyWatch bring order to your resource management, by bringing a wealth of key information all together in one place. It captures a detailed picture of each and every mobile resource, including their HR information, skills, qualifications and attributes. Define their standard working hours and rates together with those for out-of-hours. You can even upload HR documentation such as proof of qualifications and skills. Timesheets are captured automatically by the mobile DriverWatch app and holidays, absence and sickness can also be logged.